Dentist Nicky Francis of Do Gooder with an eco friendly toothbrush. For dentist Nicky Francis, improving children’s oral health and minimising waste in the dental industry are causes close to her heart. That led her to start Do Gooder, an online business that sells bamboo toothbrushes and biodegradable dental floss. For every toothbrush purchased, another is donated to a child in need. Francis has been a dentist for 20 years and said she had always given away toothbrushes to children who needed them, whether it was because their family couldn’t afford it or didn’t prioritise oral health. 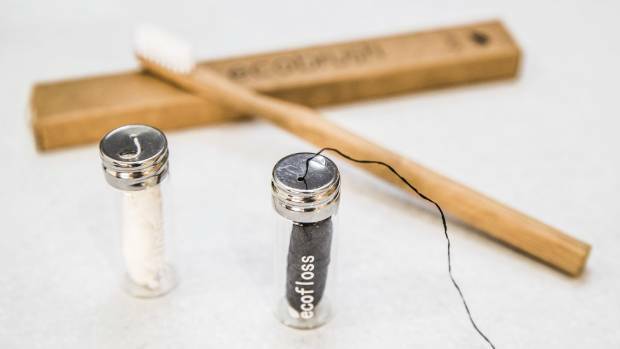 The disposability of dental products also bothered Francis, who searched for some time to find the right products that were biodegradable and sustainable. Francis grew up in Nelson and recently returned to the region after 15 years running two dental practices in the Bay of Plenty, where it wasn’t uncommon to see children from low socio-economic areas with poor teeth. She had recently bought the One Dental practices in Stoke and Mapua. Since she launched the Do Gooder website in December, things had gone “slightly nuts” with orders and she planned to develop the business by selling the products in other stores. Through her contacts in the industry, Francis was connected with kids in need of toothbrushes. She said school dental therapists were at the frontline and often saw the severity of poor oral health in children. But Francis said instead of seeing children and preventing tooth decay, they often didn’t present until they had “massive holes” in their teeth. Basic oral health services were free for eligible children in New Zealand, up to the age of 18. A high level of sugar consumption was a big factor in tooth decay and Francis said she often saw kids whose teeth were rotten as a result of drinking sugary beverages. It wasn’t just sugar, the acids in carbonated beverages also contributed to poor oral health. Francis said she told people if they couldn’t avoid fizzy drinks, it was better to drink them quickly and follow it up with water as opposed to sipping them over a period of time. That was because it took two hours for saliva, which protects tooth enamel, to neutralise acidity in the mouth. Maintaining good oral health meant brushing twice a day, half an hour after eating and flossing at least once a day.